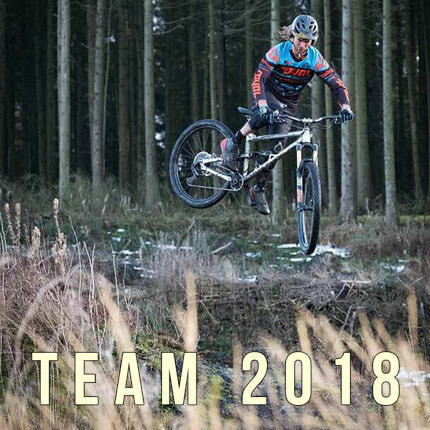 We don't call a bike ''Action Team'' and paint it in team colours without good reason. The Stereo Hybrid 160 Action Team has earned the right to wear this coveted name because we're confident it can meet the stringent demands of enduro riding under the toughest of conditions. Completely revised for 2018, it looks sleeker and handles better than ever before. The seamlessly integrated Bosch CX drive system and Intube battery work in tandem with the SRAM EX1 8 speed transmission, whose wide ranging 11-48T cassette has been specifically designed to match the torque characteristics of the motor - which translates to incredibly smooth gear shifts, even under power. The Fox 36 Float Factory fork and Float DPX2 Factory EVOL shock deliver smooth, trail-taming travel and the Shimano Saint hydraulic disc brakes have the power to bring all this speed safely to a halt. With Race Face cockpit components, a Fox Transfer Factory internal dropper post and light, strong Newmen Evolution SL E.35 wheelset, it's a factory-level setup that you can rely on to deliver mile after mile of trail-taming fun.